The week went very well for us. Our garden continues to produce far more food than I can feed to the family. What a blessing! I froze the extra bits we could not eat, such as 3 small packages of broccoli, 7 pints of beans, a handful of strawberries, a tray of peaches, etc. So, I had Rob stop by and get milk. He got 4 gallons for $10, and that should take us through the end of the month, hopefully. I also had him get coffee pods because this is a good time to stock up on something like that–when we don’t need the money for the basics. They were $19. The other items he bought were a 2-lb brick of cheese for $4.99 and a box of plain tea for $2. Cheese will keep for a long, long time, and that’s an excellent price for Bandon (which is owned by and tastes like Tillamook.) So, that’s a grand total of $36, leaving us with $17 to use until the end of the month on food for meals. I’m still on a food preservation whirlwind, and Rob was able to u-pick about $100 lbs of apples for around 50c/lb., and excellent price around here. He took Jake and they had a good time as long as Jake could dodge the bees. He hates them. It all worked out and they came home with 2 huge boxes of apples. HUGE! I’m letting them ripen up and will start making applesauce soon. I got 21 quarts of pears canned today, and have finished with the fruit cocktail as of last night. I have more pears to do tomorrow, but they are getting much lower in the boxes. I enjoy canning, so it’s not a burden and I have the day saved for that purpose. Thank goodness for that 50 pound bag of sugar Rob got last spring. It’s still holding out! The sweet pickles are coming along. By tomorrow night, they will be ready to can. Each morning and night, I boil something and pour over the cucumbers. You are supposed to use tiny, whole cukes, but chunks work fine. Of course, the eclipse keep us occupied during my canning session today! My phone camera did not take a good picture of the eclipse, even with the special glasses held up to the camera lens. What an amazing sight, I must say! Our backyard was in the prime viewing area, so we stayed home and did jobs, took a peek, worked on canning some more, took a peek, etc. It was quite creepy, but amazing, when it became cold and dark during the middle of the morning. Quite a lot more of the shop organization project got worked on as well, today, as well as some menu planning. Monday: Lunch: Sandwiches and I had salad. 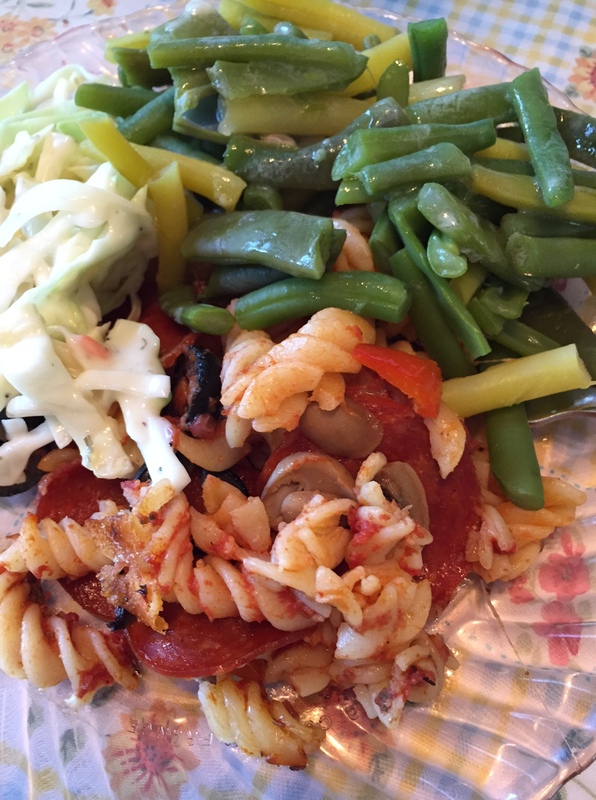 Dinner: Pizza-Noodle Casserole, green beans and coleslaw. I also found some cookies in the freezer, which I pulled out and we are eating. 8-12 ounces noodles, boiled according to package directions (mine were rice rotini, but any would work) My box was a 12 oz box, but a small amount had been used previously. Pizza toppings: I used some pepperoni from the depths of the freezer, canned mushrooms and olives, 1/2 of a pepper that was suffering from sunburn in the garden, 1 cup mozzarella cheese, and a couple of diced tomatoes from the garden, which I added after it was cooked. Pour the cooked and drained noodles into a flat baking dish that has been sprayed with non-stick spray–mine was around 8″ x 11″. Sprinkle the Parmesan cheese on the noodles and stir to coat them. Pour the tomato sauce on top of the noodle mixture, then sprinkle with the Italian seasoning. Sprinkle the 1 cup of mozzarella on top. Then top with pizza toppings of your choice. Bake at 350 degrees for around 30 minutes or until the cheese is melted and it is warm. It doesn’t take long because the noodles are already warm. If you put it in the fridge all day, then bake, it will take about 1 hour. The beans were from the garden and the cabbage was from my sister’s garden. Tuesday: Chicken soup. I never made it last week. Instead, I made ham and bean soup when the ham bone fell out of the freezer onto my toes one too many times:) There is also some beef thawed out that Rob can barbecue. We can eat the soup for lunch and the beef for dinner, or save the beef for sandwiches or salads for the next few days. I have potatoes, beans, salad, etc. to go with the beef whenever we eat it. Wednesday: Picnic lunch. We plan to go fishing. I’m not sure about dinner. We may buy some if it gets too late. Thursday: Sloppy Joes. I have hamburger and buns in the freezer. 1/2 the package will be for Thursday, 1/2 for burgers on Friday. We can have salad from the garden, beans, tomatoes, cukes, etc. as wanted. Friday: Hamburgers with pickles, tomatoes and lettuce from garden. Maybe French fries. Saturday: Leftovers. If there aren’t enough, I’ll cook something else from the garden or freezer. Sunday: Family Sunday Dinner at our house: We still have several turkeys lurking in our chest freezer. They’ve been there for a while, so we plan to pull one out and have Rob smoke it on the barbecue. He will do this on Saturday, and we will serve it Sunday. We will serve garden veggies with it, according to what is ripe that day. Last Sunday, we ended up having the bbq that was planned and Rob also grilled some potato chunks with olive oil and spices (like rosemary). He did them in foil. They were from the garden and I purposely used up all the smaller ones from what I dug up a couple of days ago. I made a rice salad with green onions and parsley from the garden, along with celery, dried cranberries and a dressing with olive oil, red wine vinegar, salt, pepper, and another thing or two that slip my mind at the moment. It was so good. I sauted green beans with garlic and coleslaw from the cabbages my sister gave me. I made a box of brownies from a mix I had been given from my sister, since she can’t bake this summer due to a remodel, and made lemonade and iced tea. My aunt brought seltzers to share. It should be easy to finish out the month on budget, and I should have enough to get 1/2 and 1/2, and a few other things I think we will run out of. $17 is really quite a lot since I have so much produce to eat. 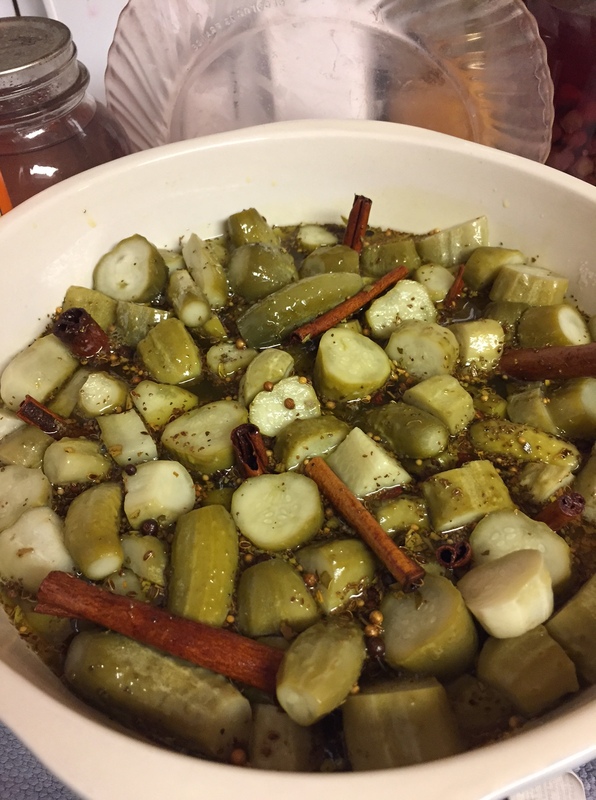 I have had the most horrible time finding a pickle recipe I am in love with. It seems as if that elusive something I am searching for is never going to be found. I’ll try again next season I suppose. That’s sad:( I hope you do find the perfect recipe. My pickling cucumbers seem to be winding down. It won’t be long until my pickle-making days are over this year, as well. Happy canning, Such a blessing to have the fruits and veggies.. Best wishes on your $100 budget.. Sounds like your doing a great job. Thank you. It almost feels like cheating, it’s so easy to stick to this time because the fruits and veggies are so plentiful. Rob got a dented gallon can of pineapple today at Cash and Carry and I’m going to can it into little jars to be usable. It was less than $3 for the gallon! We were in the path of totality too yesterday. We experienced all the same but we had really cool shadows from the trees. All in all it just felt like a weird day. There was a 60 mile traffic jam on the interstate here. Yikes! Great job on the grocery budget. Your meals sound so good. I miss having kids to cook for but some are coming for lunch tomorrow so I will have my chance. There were some big traffic jams here, too. Rob even encountered one today while running errands near where we used to live–I guess people aren’t cleared out, yet! Your pickles look delicious. 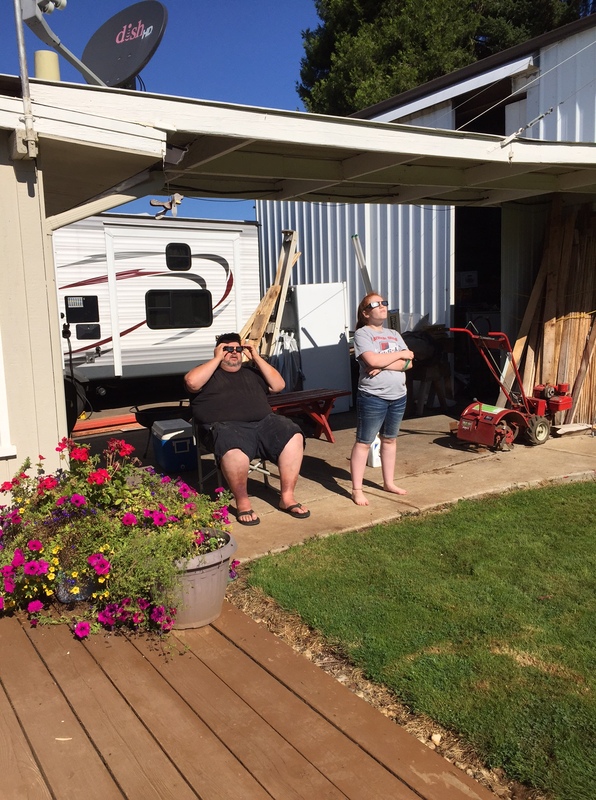 How cool that you were able to experience the total eclipse at home. Thank you. I was happy to get those pickles into the jars yesterday afternoon. I’m hoping the bushes will give me one more batch…..
It’s hard to describe how awesome the eclipse was. 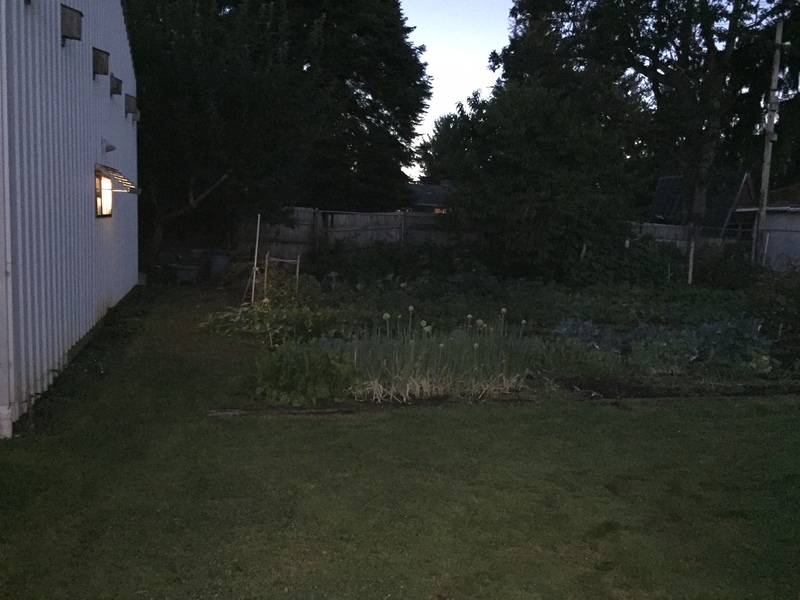 So eerie and bizarre to have total darkness in the morning—amazing! You have been busy again my friend! Those pickles really do look yummy. 🙂 Wasn’t the sky getting dark in the morning freaky? We had about 94% here and the light was just eerie. 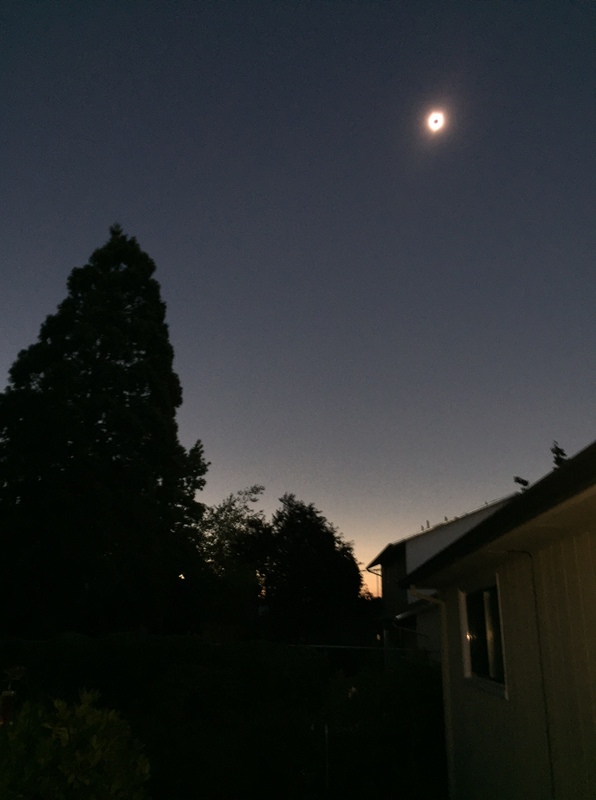 We did not have the glasses so we watched the livestream from Oregon while sitting on our back porch on the other side of the house from the sun since we had our oldest grandson here with us. Sounds like you are doing very well with your grocery budget! $100 for the whole family? I budget $75 per month, but that’s for one person! Bless, I enjoyed visiting your blog. The only reason the $100 works is because I have so much food right now. I am in the middle of preserving a bunch more, and that’s where I am using the extra money that I usually spend. The garden is going crazy right now! I also have been getting free produce from my sister–it all helps! I think $75 is amazing because you would still have to buy a whole package of the item, even if you can’t eat it all, and that would add up.